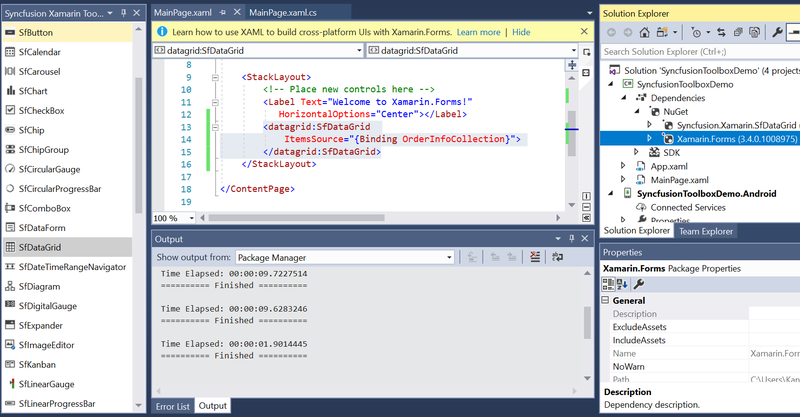 The Syncfusion Essential Studio for Xamarin Visual Studio extensions include project template, item template, and toolbox configuration. The Syncfusion Essential Studio for Xamarin extensions for Visual Studio is a combined package that contains a collection of templates for Xamarin.Forms and allows you to create a Xamarin project using pre-built templates. Toolbox support allows you to drag and drop controls from Visual Studio and automatically adds the namespace and XAML related code for the selected control. Over 135+ essential Xamarin controls like DataGrid, Chart, and ListView and unique File Format libraries. User-friendly and easy to configure Xamarin projects with Syncfusion control references (NuGet packages - Automatically downloaded from NuGet.org and no installer required). Most downloaded Xamarin third party controls in NuGet.org. 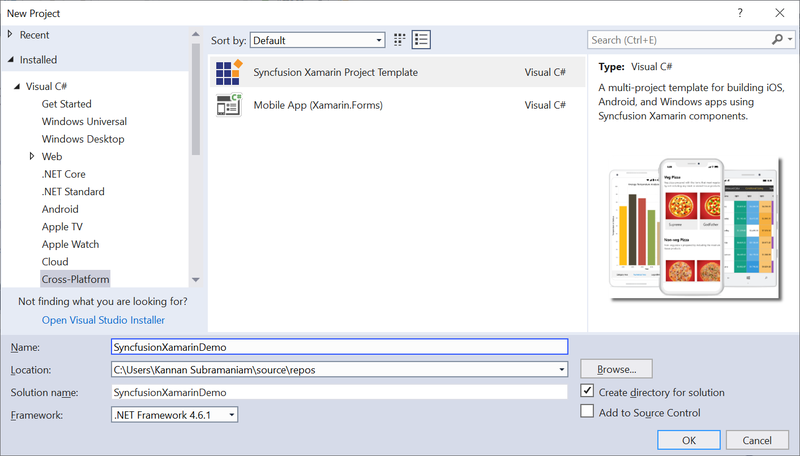 The Syncfusion Xamarin extensions install pre-built templates with Visual Studio. 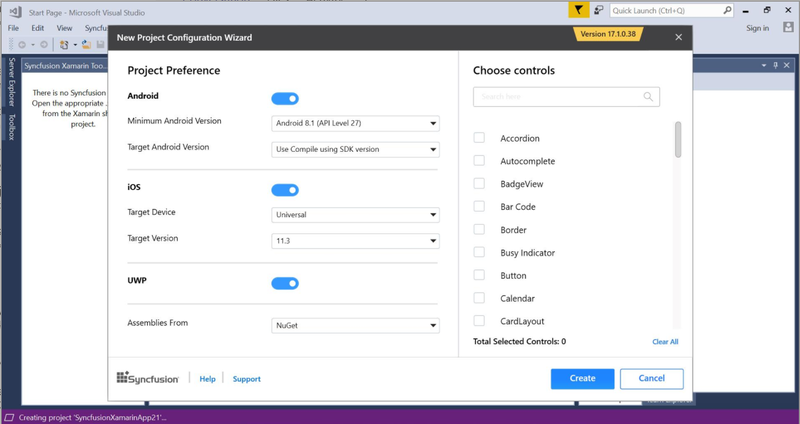 This project template allows you to create a new project with Syncfusion references, and then use configurators to customize the projects by selecting the required versions for Xamarin.Andriod, Xamarin.iOS, UWP. It also allows you to select the controls to be included in the project. These templates provide a starting point for users to begin creating projects or expand the existing projects. Toolbox support allows you to drag and drop controls from Visual Studio, and it automatically adds the namespace and XAML related code to the selected control. By default, Syncfusion control references are added as NuGet packages for the selected control, and the required NuGet packages are downloaded automatically from NuGet.org. To learn more about toolbox configuration, refer to this documentation. 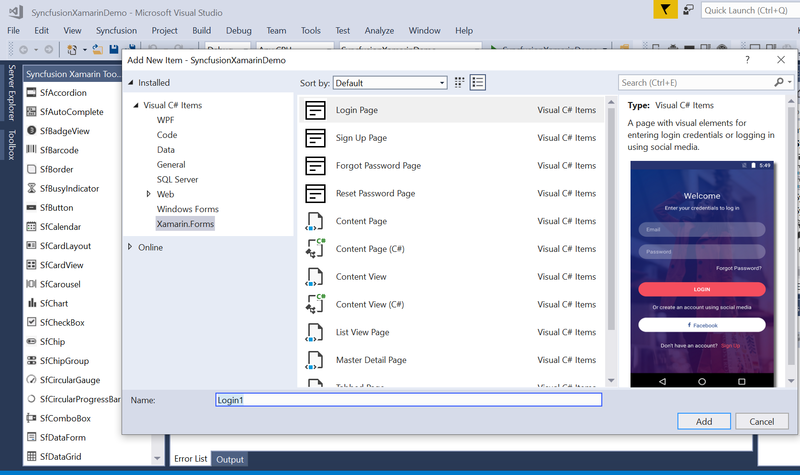 Syncfusion Xamarin extensions install reusable UI templates with Visual Studio. 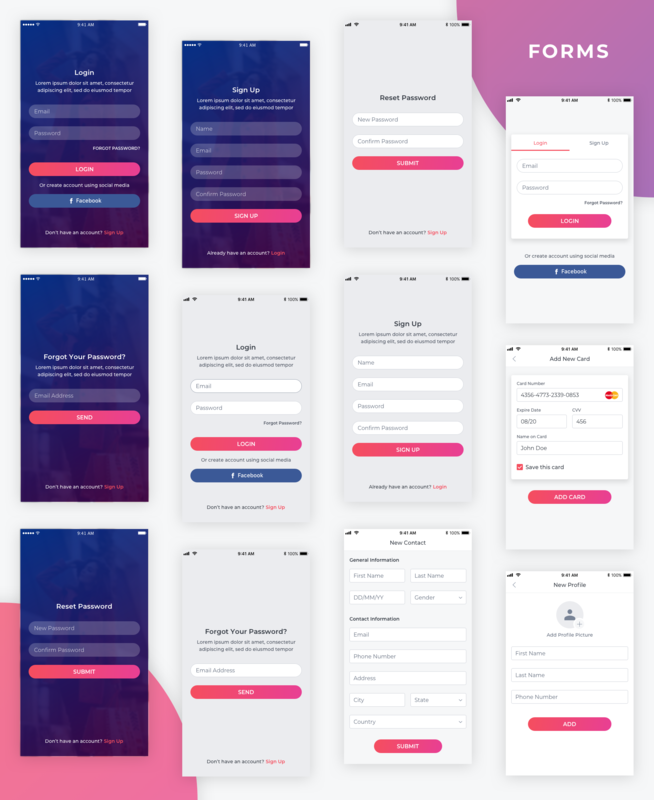 The reusable UI templates help you to easily reuse the code to add login screens to the Xamarin.Forms applications. Expect more templates in the upcoming release. Login Page: A page with visual elements for a user to enter login credentials or log in using social media. Sign Up Page: A page with visual elements for a user to enter details to create a new user account. Forgot Password Page: A page with visual elements to request an email address from a user in order to send the password recovery link. Reset Password Page: A page with visual elements for a user to set a new password and confirm it.